Wow, great drawing. Really like it and pleased that you shared it with us. That is a brilliant image. It has caught your energy as well as your form. It’s amazing what a talented artist can do in those short poses. Oh this is just fabulous . . . I mean the drawing AND the story . . . I wish I’d known about this! I can’t wait to read your post about it. This is just so lovely!!! What a fantastic experience and lovely drawing! This is fantastic! I love the energy and beautiful wildness of the sketch and I love that you participated in this adventure!! Can’t wait to hear more about it. Brave! And what an exquisite image! Such a beautiful image. I admire your bravery and your willingness to put yourself in that situation; I’m not sure I’d have the guts. I can’t believe she managed to create this in just 10 minutes because wow is it so good. I think it totally captures the strength of your stance as I can completely see you up there owning yourself in that moment and that really comes across. I am really looking forward to hearing more about your day, it sounded fabulous. How did you hear about it? This is beautiful. 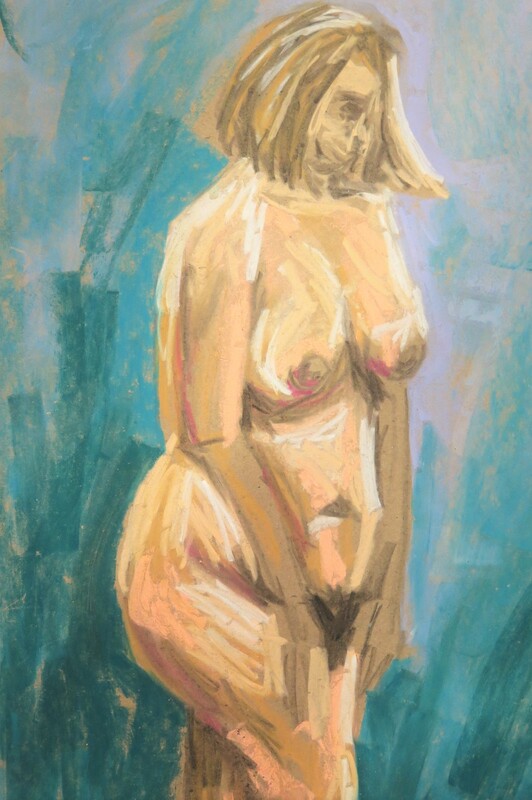 I have never had the talent for drawing, but I loved the Figure drawing class I took in college. Wow. What a piece of art. Love it. So glad that you shared this. I am so envious of this. Life drawing modelling is something I’ve always wanted to do but I’m too much of a fidget to sit still for hours upon end! I’m absolutely stunned that this only took 10 minutes, it’s fabulous! To me it shows confidence, humbleness, and poise. Hands down on your thigh not covering your delicate parts, relaxed body, head seductively down – it seems very intimate. The artist captured an innocent beauty quality. Really like this! That’s pretty cool. I would love to have done that, posed and see the drawings. And of course to be in the audience with nine naked women in front of me. I’m sure it would be hard to draw. p.s. I don’t know you, but the drawing captures an alive spirit. I would love to read your post on the experience of posing and what it felt like. WOW. 600 seconds, that’s so talented. And what a fabulous thing to have on your wall.